The long-advertised polar blast will soon be with us, following a comparatively easy Monday, and it will be with us for some days to come. It will likely bring lots of school closings mid- and late week, lots of cancellations, serious travel hazards and dangerous wind chill. Part of the ingredients to the roughest week of winter is lake-effect snow, and part of forecasting lake-effect snow potential is knowing how much ice cover is already out there. 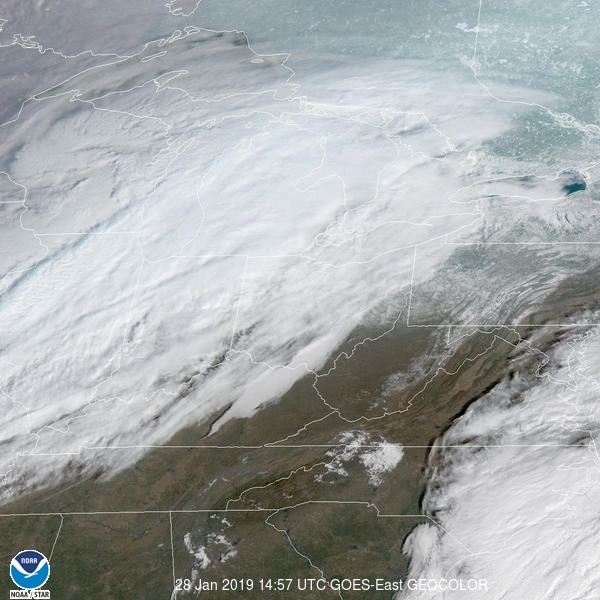 We know, as of Sunday, there were still large areas of open water in the eastern half of the lake, and we know that because there were some good openings in the cloud cover for satellite imagery. As for the growing ice cover, the freezing of Lake Erie isn’t like popping an ice cube tray into your home freezer. It takes time. It happens faster when winds are light. That will not be the case until Friday at the earliest. Strong winds, like strong currents in a stream, slow the icing process. As I write this, we have a fairly brisk wind from the east for most of today. That will push lake ice to the west and help destabilize the ice that is already out there. The orientation of the winds can be seen here, with the direction of the wind barbs pointing east to west in our region. That’s all changed by Tuesday morning. Winds will be coming in from the southwest, and strengthening. The shifting winds will again destabilize the loose ice and bring in arctic air. 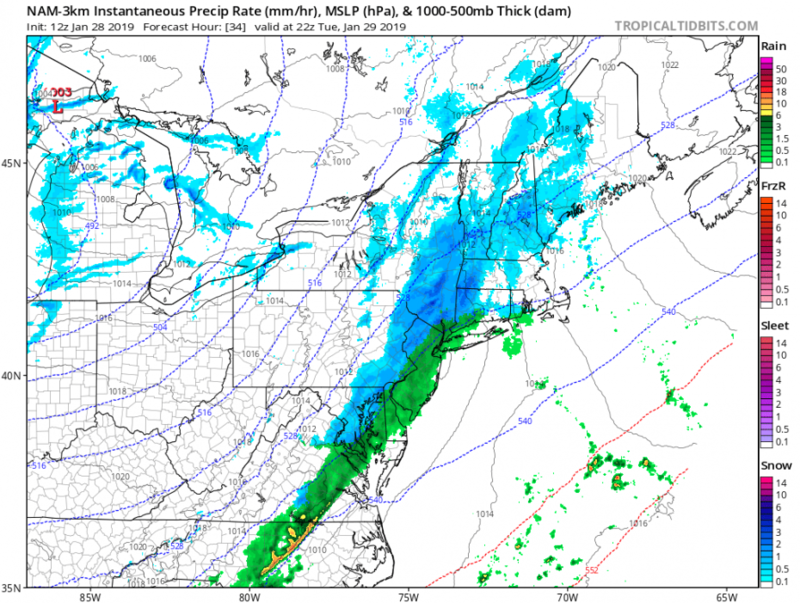 The temperature difference between the 32-degree lake and the atmosphere at about 5,000 feet will be more than sufficient to begin to intensify the lake effect. That temperature difference will increase drastically by Wednesday into at least early Friday, making moist air from open water rise into strong lake-effect convection. Some of the models seem to be underplaying the moisture and accumulation potential, but we can at least look to a model for lake band placement. Always remember, no one model has all the answers. This lake snow will not be a steady-state event, staying in place like the twin lake-effect storms of November 2014. Kinks in the upper air flow will keep winds shifting from time to time, meaning placement forecasts will need frequent adjustments during the week. By midday Wednesday, this model shows a well-organized band close to at least the southern part of the metro area and maybe south Buffalo. Some models suggest the band will shift southward for at least a while on Wednesday, just below the metro area and into more hilly terrain. Even if that’s the case, enough low-density snow will be in place for serious problems with blowing snow, worst within the band, but also where snow has already fallen. Travel will be at least hazardous and, within the band, treacherous. Winds will produce some whiteouts and near-blizzard conditions at times, with occasional blizzard conditions not out of the question. (A blizzard requires three consecutive hours with sustained winds or frequents gusts of 35-plus mph and visibility at 1/4 mile or less). The orientation of the wind will make north-south roads the most difficult. 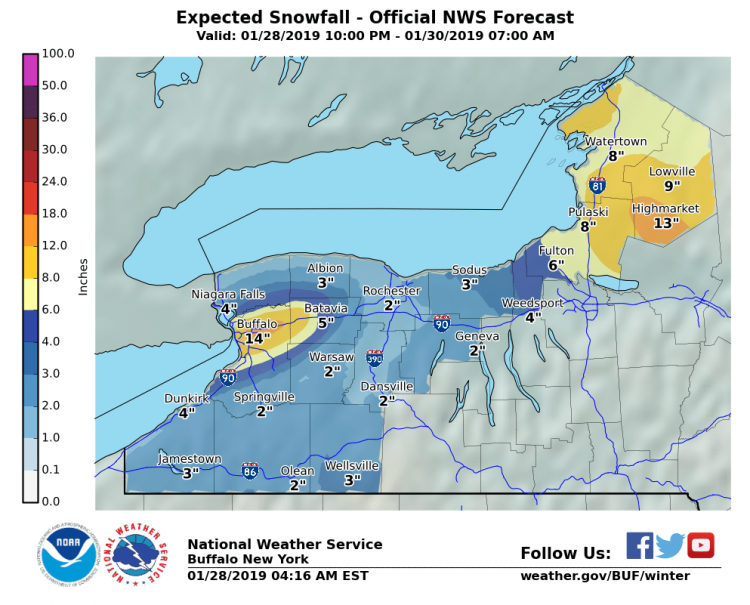 As far as accumulations go, at the beginning of the week we can say amounts may exceed a foot near Buffalo, the eastern and southern suburbs, and more than that in the hills of southern Erie, Chautauqua and northern Cattaraugus counties. Odds seem to favor lesser amounts north of the Northtowns, in Niagara and Orleans counties. After that, my current feelings are amounts will increase dramatically to the south, as aforementioned. Maybe not as far south as Jamestown or Olean, but into the hilly terrain below the Buffalo Southtowns and in Wyoming County. Now, about the extreme cold. 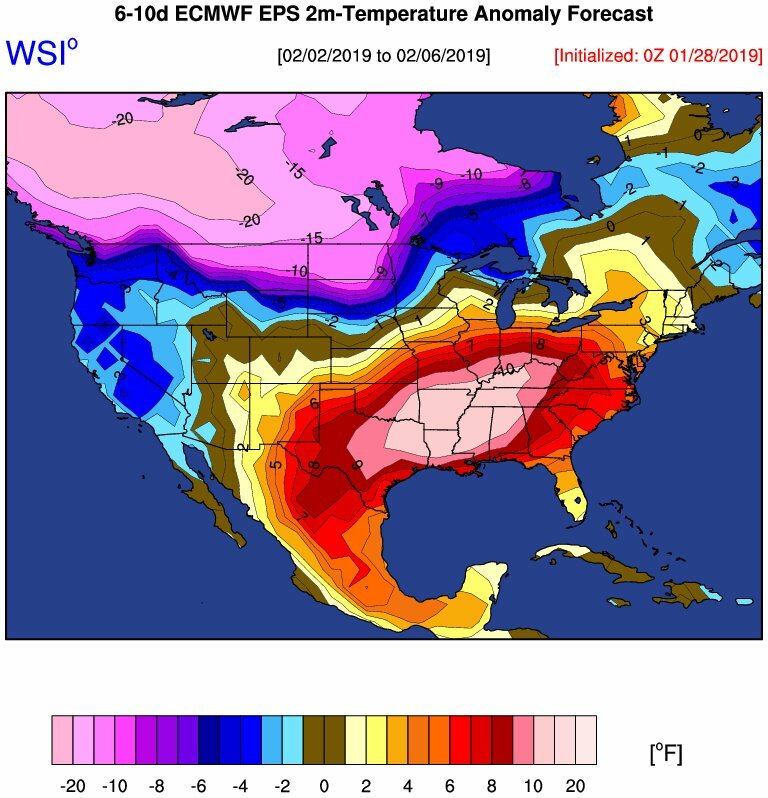 This was a European ensemble forecast for where our lobe of the polar vortex would be on Wednesday. It still holds. This rare extreme cold outbreak will bring temperatures in the 0-to-5 range at lower elevations by Wednesday morning and to minus 5 by Thursday, with even colder readings to the south. We usually get subzero temperatures with clear nighttime skies and light winds. But these readings will be accompanied by stronger winds, making for a substantial risk of frostbite and hypothermia in a short time for those overexposed. The wind chill will average in the minus 20s and, occasionally, dip to the minus 30s. 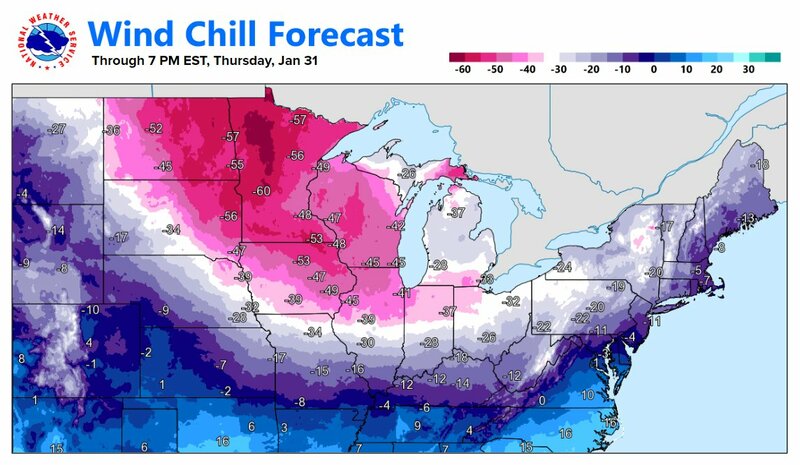 Take a look at this National Weather Service forecast map for 7 p.m. Thursday wind chill values. I expect the wind chill to be not far from that range Wednesday morning and a little worse than that range Thursday morning. Winds should slacken somewhat by Friday morning, though it will still be bitter cold. Generally, I’ve made it a practice not to try to predict school closings. In this case, I’d give a heads up to parents and school administrators to make some preparations for closings and cancellations on a large scale at least on Thursday and quite possibly on Wednesday. Friday is a tougher call, with less wind chill. And now, some good news. A few weeks ago, this extreme cold looked to be more persistent. It won’t be. Some of it may return later in February, but for now a dramatic turnaround will be here by Sunday, with daytime highs near or above 40. 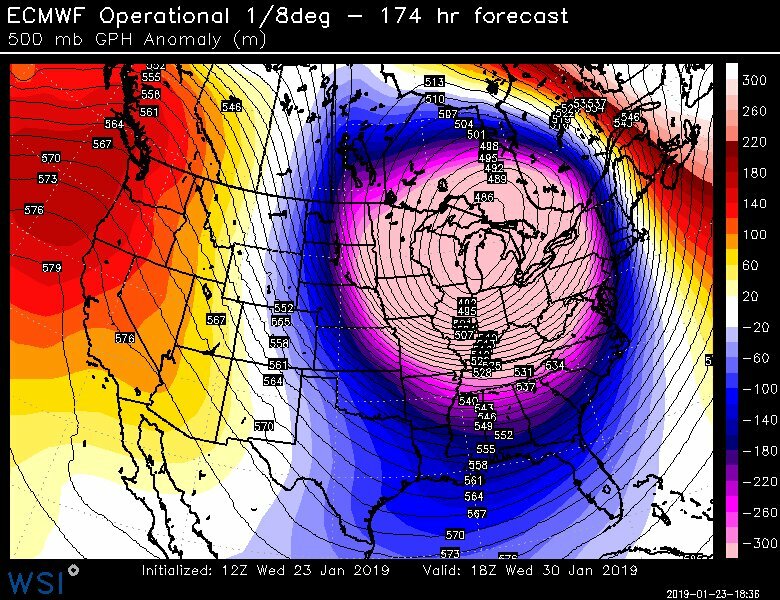 The entire upper air pattern will be shifting, with a warmer ridge in the east replacing our lobe of the polar vortex. Take a look at this chart by IBM’s Dr. Michael Ventrice. Snowmobilers! Put down those torches and pitchforks!